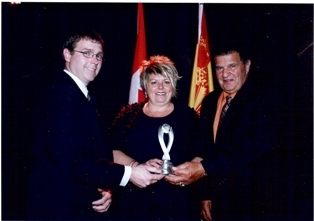 Discovery Drill Manufacturer (DDM) Ltd. received the New Frontiers Exporter Award on May 30, 2012 in Fredericton, New Brunswick. Discovery Drill Manufacturer (DDM) Ltd. was recognized for their leadership and excellence in Export development and the success that New Brunswick companies are achieving daily on the International stage. John Labonville, owner of Discovery Drill Manufacturer (DDM) Ltd., is the 2007 recipient of Enterprise Chaleur’s Entrepreneur of the Year Award. He specializes in the mineral exploration sector and the drilling industry. He developed a turnkey highly efficient hydraulic diamond drill with the operator in mind, both from a safety and ergonomic perspective. Launched in 1999, his business employs seven people full-time.